Buying property is the biggest investment that most Canadians will ever make. It takes a lot of work to make sure it is a good one! Our Sudbury gutter cleaning is here to make sure that things are running smoothly – literally! Expert property maintenance services can mean the difference between unnecessary repairs and preserving the life of your property. Something as routined as a Sudbury eavestrough cleaning can mean the smooth running of your home or business for years. Most Canadians, we understand the temperamental nature of our landscapes. Plant life, storms, rain and shifting weather conditions create obstacles for property owners at one of our most vulnerable points. Debris falls on roofs, and into the gutters than run along the roof. When gutters become clogged they can cause all sorts of problems to the integrity of your drainage system. The roof of a property is a difficult access point for most individuals. In addition to the very common fear of heights, shared by millions of Canadians, there are safety risks as well. Let our Gorillas be your eyes! We have the ability to climb safely onto your roof to make sure that your gutters are working as hard as we are. 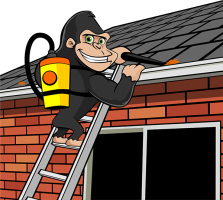 Gorilla technicians do more than just clear gutters but will take measures to ensure that the job is done correctly and clogs stay clear. Our three step Sudbury eavestrough cleaning process includes removing any potential blockages from the roof surface. Gutters can become clogged up right after cleaning if roof clutter is left behind. Once removed, our Gorillas use tools to remove clogs and test drainage. No task is too great for our Gorilla technicians and we love a challenge. We pride ourselves on the work that we do and would love the opportunity to take these dirty jobs off of your hands.